Seattle Times readers have sent us 950 questions about the closing of the viaduct and the opening of the new tunnel. We answer a few of them in this fourth Q&A. The Alaskan Way Viaduct closes forever at 10 p.m. Friday. 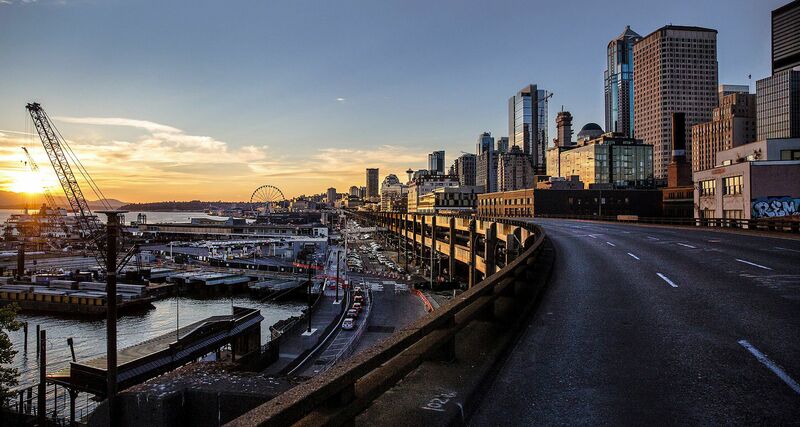 There will be no Highway 99 through downtown Seattle for three weeks, while crews connect ramps and prepare the new four-lane tunnel to open about Feb. 4. We’ve been answering some of the 950 questions Seattle Times readers have sent us about the $3.3 billion project. This is the fourth in a series of Q&As based on reader questions. Part 1: When does the viaduct close? How much is the tunnel toll? Part 2: Are pedestrian and bike paths going to stay open? How will I get around? Part 3: What does the tunnel opening mean for bus routes, detours and tsunamis? Will we get a chance for “one last drive” on the viaduct? How long will I have to pay taxes for this project? Did they save any of Bertha’s parts? Will the West Seattle Bridge ramp to northbound Highway 99 remain? Can exits from the new tunnel to downtown be added later if WSDOT decides there should be access? What will traffic be like in the three week shutdown on downtown surface streets? What is the expected increased travel time for buses coming from West Seattle? Why aren’t the Alaskan Way surface-street signals synchronized? Will transit options improve from South King County so I don’t have to drive downtown? Will there be cellular service, Wi-Fi, and AM/FM radio reception inside the tunnel? Why not leave part of the viaduct in place for a park like the High Line in New York City? What’s being done to ensure South Lake Union backups don’t cause slowdowns leaving the tunnel northbound? Time is running out, so make a pilgrimage now. No official drive is planned, though dozens of drivers cruised the upper deck in vintage cars New Year’s Day. Free walking access and festivals are scheduled Saturday, Feb. 2, throughout the afternoon on the viaduct and in the tunnel. Ribbon-cutting ceremonies at the south end start at 11:30 a.m. Reserve an entry time through the state’s event website, www.99stepforward.com. A 5-mile fun run, sponsored by engineering contractor HNTB, begins at 7:30 a.m. that same day. Cost is $45. On Sunday, Feb. 3, the Cascade Bicycle Club sponsors a 12.5-mile ride from 8 a.m. to 11:45 a.m. Registration is $40, or $20 for age 12 and younger. To date, more than 54,000 people have registered for the free or paid events. The last contractor payments should be done by early 2021. But the debt is being paid off until 2040, by gas taxes approved by the Legislature in 2003 and 2005. That because the state’s $2 billion share of the $3.3 billion Highway 99 budget is commingled with other debt-financed Washington State Department of Transportation (WSDOT) projects. Total gas taxes in Washington, including the federal 18.4 cents, are 67.8 cents per gallon, the nation’s third highest. Only a few pieces of the massive tunnel-boring machine called Bertha were saved. The Port of Seattle, with an assist by tunnel-machine builder Hitachi Zosen, salvaged a 20-ton remnant of Bertha’s 57-foot-long spokes, and the 10-ton triangular nose piece, for future display at a port park or terminal. The Museum of History & Industry (MOHAI) kept the shell of the control-room console and a few 75-pound steel cutter teeth. Most of the disc-shaped cutter and cylindrical shield were recycled at Nucor Steel in West Seattle. Interior parts such as wiring, electric motors, hydraulic lift arms and walkways are stored around the world for possible reuse. Yes, that curlicue ramp will stay. Also, the northbound Sodo bus lane will remain, from the bridge to the new stadium-area interchange. No. The tunnel is 200 feet below street level mid-downtown, and where would a downtown tunnel entrance be placed? Such a feat would require billions of dollars for minimal traffic improvement. Currently, only 25,000 cars a day take the Seneca-Columbia exits. Viaduct bus routes that carry 25,000 or more people a day at Seneca-Columbia will take new waterfront bus lanes in 2020-21. Exit signs at the north and south portals include the words “Downtown” to remind drivers they can go toward the city center near either Denny Way or First Avenue South. What will traffic be like in the three-week shutdown on downtown surface streets? Nasty. The state won’t make predictions, but staff point to previous Highway 99 closures where commute trips averaged 15 to 20 minutes longer across the region — taking 75 minutes on average from Federal Way to Seattle. Three-mile backups, or longer, along Beacon Hill are normal. Delays will be worse when crashes or stalls occur. Generally, if you usually drive or ride a bus at 6:30 a.m., you’ll need to leave at 5:30 a.m.to make sure you arrive at your destination on time. King County Metro Transit says past data show bus trips averaging at least 10 minutes longer — but often far worse. To deal with frequent delays, bus riders should allow 30 to 60 minutes extra time, Bill Bryant, Metro service development manager, said Wednesday. The city’s policy is to coordinate the signals to favor north-south motorists during peak morning and afternoon commute times. But at other hours they are “free allowing,” which means pedestrians can press a button to trigger a walk signal across Alaskan Way, said Mafara Hobson, Seattle Department of Transportation spokeswoman. Pedestrians crossing Alaskan Way often outnumber vehicles passing through. Another factor is ferry arrivals, when motorists coming from Bremerton or Bainbridge get a prolonged green light to cross Alaskan Way into downtown. Light-rail stations serving Highline College, Star Lake and central Federal Way, plus more park-and-ride space, aren’t scheduled to open until 2024. A few miles inland, Sounder commuter rail has at least 150 empty seats available per train, but garage parking stalls fill early for Sounder stations in Kent, Auburn and Sumner. A nifty option is the 719-stall James Street park-and-ride lot, southwest of ShoWare Center, where people can walk the half-mile east to Kent Station or find a bus. Or seek a bus route that connects to another Sounder station. Phone service and radio reception will be available, though WSDOT will override broadcasts to announce any emergencies inside the tunnel. No Wi-Fi is planned. State officials argued this sort of linear historic park would require costly earthquake retrofits of the 66-year-old structure. Also, the city’s waterfront vision already includes new aerial walkways and parks, including those that would descend to the Elliott Bay shore near Pike Place Market, and near the state ferry terminal. Northbound cars leaving the tunnel can exit at a Republican Street ramp, then turn left on Dexter Avenue North, to reach Mercer Street toward Seattle Center or I-5. Or they can turn right on Dexter toward downtown, Denny Way and Belltown. A lot will depend on how the city manages traffic-light timing. If exiting cars are allowed to accumulate, that will cause overflow into the tunnel mainline and increase the chances of rear-end crashes. A major bicycling route on Dexter already coexists uneasily with office-building construction, charter buses and for-hire cars that encroach on cyclists. Expect the unexpected, and drive defensively. Got a question? Tell us below.